Sevastopol — hero city, the city of Russian sailors, city — Russian port. It does not matter that now he officially belongs to Ukraine. This city is worth to go and visit very interesting places. 1. Inkerman. The fortress city and its rich heritage. Here is the famous factory of vintage wines "INKERMAN". In the basement of this plant Matures the wine in oak barrels. Inkerman cave monastery is also a famous landmark. Caves were the first monks housing. In the rocks was built entire temples, cutting down the stone altar, throne, bench. Next to the existing monastery can be found abandoned temples in the Monastery hill. And on the mountain — the remains of the fortress Kalamita. Here, Inkerman stone is mined — a natural white stone, easily treatable. This stone is very durable and frost resistant, so popular. In Inkerman quarry there is an interesting lake. According to legend, the water is Holy, because the lake was formed by the Holy spring. The water in this lake is unusually blue colors and pleasantly cool. To Inkerman you can get on the 104 bus or minibus that go with "Fifth kilometer" ("Fifth kilometer" can be reached by many buses), on the train from Sevastopol train station, or on the boat with the Sevastopol naval station. 2. Balaclava. The unique curved Cove, attracting people from all over the world. "Fifth kilometer" to balaclavas can be reached by route 9. Here is the Genoese fortress Chembalo. From the height of this fortress offers a beautiful view of the surroundings. And in the fortress is something to see, because it's a real defensive terrain. Next to Chembalo is the Church of the Twelve Apostles — one of the oldest Orthodox shrines of the Crimea, preserved in good condition. Well, how not to visit a top-secret plant for repair of diesel submarines. Once his work had only known for a small number of people, and the workers only knew about the place where they worked. Now you can buy a Hiking tour of the factory and together with a guide to see the storage, repair docks, tunnels, end-to-end tunnels, command posts, silo, and also the Museum of the cold war. 3. Fiolent. Not far from Balaklava is one more interesting place is Cape Fiolent. He folded volcanic rocks and so the cliffs have interesting color and texture. Here is Jasper beach . To get to the beach with clean water, you need to overcome 300 steps ("Path of health"), on the way visit a small monastery with a sacred source. There is another option — to sail on Fiolent on the boat, but then you will not see that beauty, which opens during descent and ascent. 4. Quay. The length of the waterfront — about 2 miles. It stretches from Nikolaev Cape to Cape Crystal. Here you can sit in silence and watch the sea, swim in a makeshift beaches, feed the pigeons, listen to local artists, a gift market to see the sights — monument to the scuttled ships, the sundial, the Dragon bridge, summer stage, the monuments to the heroes. With the Count's pier boats depart to the mountains, the village of Holland and the area Zakharova. And if you want to touch nature and get the most positive emotions — go to the Dolphinarium, which is located near the Souvenir market. Several times a day performances, which are the dolphins and seals. For a small fee you can take pictures with the sea animals, and swim in the small pool with the dolphins. 5. Sapun-Mountain. During the great Patriotic war, the breather-Mountain was a key defensive position. In memory of the feat there is a great Obelisk of Fame, plaques,eternal flame, the Chapel of St. George, the Park of Glory, as well as the largest work of contemporary battle art — the Diorama "Storm of Sapun Mountain". A painting is a semicircle in front of the observation deck and proceeds to substantive plan - the weapon, debris, items of battle, collected from the field of battle. It creates the illusion of full presence. In addition, visit the exhibition halls and military equipment. 6. Hersonissos. The Chersonese. Formerly Kherson, Sarcona Korsun'. Hersonissos — Polis, founded by Greeks on the coast of the Crimea. Since 1827, this lost city began to dig, and the excavation lasted to this day. As a monument of Antiquity, Chersonese included in the list of world heritage of UNESCO. Museum-reserve under the open sky attracts epigraphic monuments, works of art, household items, tools and so on. The finds are exhibited in the museums of the city, but also in State museums of Russia, including the Hermitage. Walk the streets of the city, visit the museums and the Cathedral of St. Vladimir, and then — go down to the sea and listen to one of the beaches. 7. Historical Boulevard and the street Heroes of Sevastopol. Historical Boulevard is both a nature reserve of rare species of trees and shrubs, and integrated historical monument. It is located in the heart of the city. Walking through the Historic Boulevard, you will see a huge number of monuments and memorials, as well as one of the largest Panoramas in the world. Panorama defence of Sevastopol is a picture area of about thousand square meters. If you go on the street Heroes of Sevastopol, you will come to another famous monument of heroism — Malakhov Kurgan. The memorial complex includes about 20 monuments and memorial places. Also exhibited here are the real guns during the First defense of Sevastopol. 8. Aquarium. In the center of the city there is another interesting Museum — the Maritime Aquarium. It presents coral reefs, shrimp, invertebrates, sea and tropical fish, tropical, reptiles, turtles, freshwater fish. In addition to the wall of swimming pools, in the center of the Aquarium there is a swimming pool with a diameter of 9 meters. There you can see lovely tropical sharks. For each aquarium artificial scenery, so to watch the fish a pleasure. And the size of the Museum itself — just amazing. 9. St. Vladimir Cathedral - burial Vault of admirals. The Cathedral is located on the Central hill. During the Crimean war in the crypt of the temple was buried admirals Kornilov, Nakhimov and Istomin. Only in the lower Church 11 graves of Russian admirals and naval officers. The Cathedral is built of Inkerman stone and marble. A very interesting monument of architecture. 10. The naval Museum. If you come to "the city of Russian sailors", then you just need to visit the Military-historical Museum of black sea fleet of the Russian Federation. The Museum reflects the whole history of the black sea fleet from its Foundation to the present day, collected valuable artifacts and unique documents, maps, devices, premium weapons. Pulling itself to models of ships, battle flags, trophy relics, military uniforms from different times. A ticket to the Museum is inexpensive, and this beauty you have to look. We only considered 10 of the most main places of Sevastopol, which, at the first visits to the city. But the interesting attractions of course much more. So in Sevastopol have to go back from year to year. 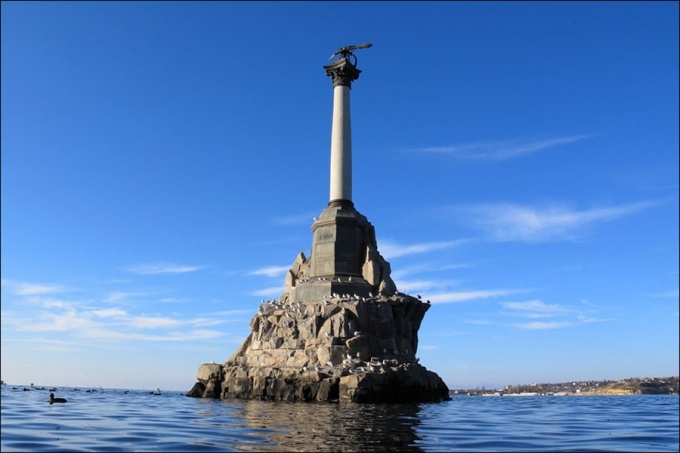 The legendary and glorious hero city of Sevastopol is located on the southwest coast of the Crimean Peninsula. The history of this amazing region has more than 2,500 years. Its unique attractions attract every year thousands of tourists seeking an eventful and exciting holiday experiences. The main attraction of the city are the ruins of the ancient Chersonesos Tavricheskogo. This is a huge Museum complex under the open sky occupies a vast area between Quarantine and Sandy Bay. 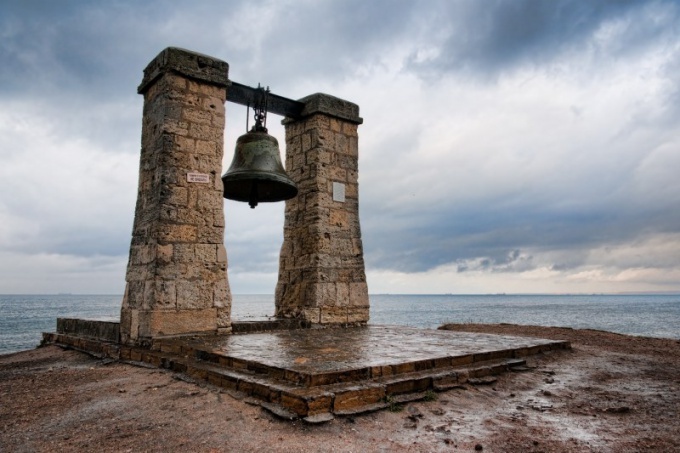 You can reach it from the center of Sevastopol by public transport. Of the great buildings of Chersonesos is possible to note the remains of the ancient Basilica, bell, Cathedral of St. Vladimir, "mint", the only surviving in the Crimea, the amphitheatre and the "Western gate". In Sebastopol there are several museums, the most interesting being the Navy Museum of Russian black sea fleet, the diorama "storm of Sapun mountain" panorama "defense of Sevastopol", the submarine Museum "Balaklava", Sevastopol Museum of local lore. On the embankment of the hero city you can always book a boat tour in the famous Bay. The Sevastopol aquarium occupies a special place among marine museums of the city. It is the oldest public marine aquarium of the Crimea and Europe. Many pass by, embarrassed by the small size of the Museum, not suspecting that the aboveground part of the complex – only one of several spacious halls of the aquarium. The Museum exhibits all kinds of tropical and the black sea fishes, and also reptiles and exotic animals. In Sevastopol there are two major Dolphinarium in artillery Bay and Cossack Bay. The latter will be interesting for people who need in the program of Dolphin therapy. Shows featuring dolphins will delight children of any age and will leave many pleasant and bright impressions. – Children's town on the Avenue of Victory is appealing to young children. On campus is a mini-zoo, a puppet theatre, children's Park with statues of your favorite fairy tale characters and pyrotechnic complex "Brillianteer". Close to Victory Park on the beach is the water Park "Zurbagan". The complex includes 15 slides for visitors of all ages, 7 swimming pools, outdoor cafes, fountains, waterfalls and hot tubs. In 2012, in Sevastopol on the streets of Biryulevo opened the Sevastopol zoo, which has found a shelter animal artists, retired, and other animals received in nature and in captivity various injuries. And entertainment complex "Mussone" will delight children of all ages a large number of slot machines and rides. In addition, in TC "Musson" has the largest in Crimea, an ice skating rink. On the territory of Sevastopol is located 6 tennis complexes, the largest of which are "Live" and "Bastion". On Cape Fiolent, in addition to pure pebble-sandy beach and lovely landscapes, it is possible to find the complex under the open sky – tag "Alpha extreme". The analogue paintball occupies the territory of the disbanded military unit that will allow game with different difficulty levels. In different parts of the city you can visit museums, entertainment venues, shopping malls, horseriding and Quad Biking. You open the doors of theatres, cinemas, night clubs and much more. After all, Sevastopol is a city where everyone will find something fun to do.